There are so many ways to add colour to your bathroom, but the floor is a great way to inject a lot of colour in one go. Try our flooring ideas to get a beautiful bathroom that reflects your personality. Remember that a bathroom floor needs to be able to withstand a lot of use, steam and moisture. But this doesn’t mean that you have to sacrifice style. There are plenty of ways to add a splash of colour to your bathroom and still have a floor that lasts for years. Here are 5 of the best. Using dark wood flooring can be a great way to contrast your floor with a lighter-coloured bath, wash basin or toilet. Long planks of dark wood create an elegance that you don’t get with tiles. But make sure that you choose a wood that has been treated to cope with the damp and humid conditions of a bathroom. One of our favourite flooring ideas is parquet flooring. It’s back – and for good reason. Parquet flooring brings such an interesting pattern that not only do you add some contrasting colour in the wood but you also create a unique style that your visitors will be jealous of. Don’t be afraid of going for a bold print for your bathroom floor. You could choose tile or vinyl flooring depending on your budget and personal tastes, and add your own personality to your bathroom. If you like the vintage look, you can certainly get it with a multicoloured print floor coupled with an all-white bathroom. If you’ve not got much money to spare, why not just paint over your wooden floorboards in your bathroom? This is one of the best flooring ideas for low budgets as you can transform the look of your bathroom without having to go through the expense and hassle of pulling up the old floorboards. Choose a colour that contrasts with the rest of your bathroom to make a statement. Don’t forget to choose a paint suitable for bathrooms, though – otherwise all your hard work could be for nothing. A patterned bathroom floor looks fabulous and is the perfect way to brighten up an otherwise plain bathroom. 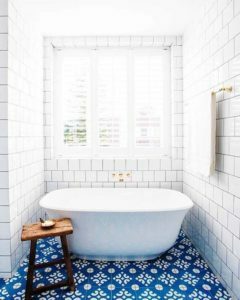 The royal blue tiles above stand out and are so shiny – we love the contrast between the floor and the white tiles with the dark grout. If you’re ready to transform your bathroom floor, go through your flooring ideas with a flooring specialist by using our service to get up to 4 quotes from reputable floor layers.